Are you passionate about YUGO cars and Yugoslav history? Do you like story-telling and meeting new people from all over the world? Do you have a driving license and are able to operate a YUGO? If your answer is ‘Yes!’ to all above you should apply for the part time job you have been dreaming of! YUGOTOUR tells the stories of Belgrade, the ex-capital of Yugoslavia, to visitors in a fun, interesting and exciting way: From a Yugo! We are open year around and have our own YUGO’s. We have an enthusiastic crew of young, fun guides and would love you to join the adventure. I’m a certified guide for French, Spanish and English and I already do tours in those three languages all around the country. Hi, i’m law student from Belgrade, have a driver’s licence have a lot spare time and i love communication with strangers from other countries. Also im big history freak so i will be full of stories . I’m a medical student from Belgrade. History is my kind a hobi, especially Serbian and Belgrade histroy. I also have driver’s licence, and many years od driving in Capital’s jams. Since we share the passion of travelling, expanding our and our guests’ horizons and meeting various people, I have decided to apply for the position of a guide advertised recently online. While I would say that I am younger by heart than as far as age is concerned, I can definitely reply positively to the rest of your questions. The comforting part is that in tourism it is experiences that count, I believe. My first independent driving experience was at the age of 15 when I ‘borrowed’ my dad’s super polished Zastava 101. I passed the test sucessfully and parked it back in the garage scratchesless. I got my very first car way before I passed the offical license test. It was a Fiat 500 made in Poland, known as ‘Pegla’ in Serbian. Later on I was proudly driving around with a few more Zastava models. The truth is I have never owned a Yugo, but my best friend did. A golden coloured one, full option, assembled for export! The demand on the ladies’ market increased rapidly, for him at least. I decided that I need to change the strategy, started backpacking and… fell in love – with Asia. I was made in Ljubljana, Slovenia. The year of production: 1969. Mileage: very well travelled. In fact I am grateful to my parents for this perfect timing. Those were the golden years of Yuga; and the Socialist Republic of Slovenia was the golden egg of that once almighty country. And I can fully remember what life looked like on our side of the Iron courtain before it fell. Turbo flower-powered I started traveling in my very early years at the back seat of my grandpa’s Fiča. In those times we were somehow obliged to discover our homeland first of all. Soon after I started peeping into not so far away countries like Hungary, Czechoslovakia, Poland, and the Western Europe of course. After the split up of Yugoslavia traveling in Slovenia became more affordable and faraway places moved much closer. I got really excited in the mid 90’s and wanted to taste all the Mother Nature and its inhabitants can offer to us. Now, I’m 46 and have no intention to obstruct my driving force. I have visited around 110 countries worldwide, and have lived in 5 different countries, including Iran, Lebanon and Georgia. For the past ten months, I have been living in Belgrade and will stay here for at least another year, hopefully. I am a licensed professional tour guide. I have been guiding incoming and outgoing tours in English, Slovene, Serbian and Croatian for more than 20 years around the world, with all kinds of group profiles, from school groups to VIP individuals. Among others I have driven several Fly&Drive tours around the USA with different compact, SUVs and up to 15 seater vans. I escorted incentive groups driving 4WD Safaris in South Africa, and groups driven by Cuban vintage models or a looong convoy of Renault4s from Dubrovnik to Montenegro. Yugo?? Never officialy. But I ‘borrowed’ it from my best friend a couple of times. I think I can handle it. Many thanks for your exciting historical essay! We would really like to meet you and therefore want to ask if you can send the same story + your CV to info@yugotour.com, so we can inform you about the rest of the selection procedure. it is said they have nuclear missile subs patrolling the antarctic and they warned america never to invade or it will be nuked as copverhensimely as the soviet union could have done, probably better, moreï»¿ devastating! Da li je konkurs aktivan i u ovoj godini? yes, this job is open to applications. 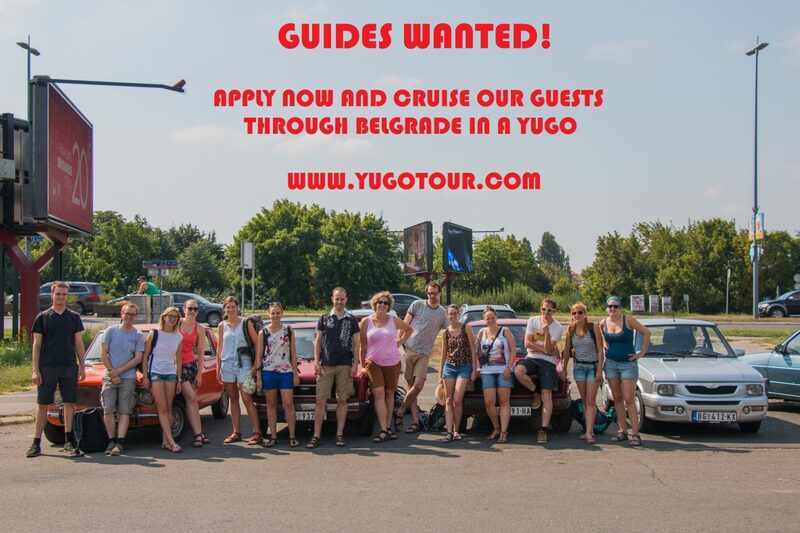 Soon we will advertise for new guides, but please send your CV and letter of application, in English, to info@yugotour.com if you want to apply!